With holes spaced out every inch or so, it’s not surprising that traditional belts rarely fit well. SlideBelts take a no-hole, precise-fitting approach. You can adjust the belt in 0.25” increments, via a tiny tab that catches on 30 teeth-like ridges sewn subtly on the belt strap. Husband-wife team Brig and Michelle Taylor have been perfecting SlideBelts for almost a decade. Back in 2004, Brig was teaching in Moldova when a student gifted him a ratchet belt. The Taylors were intrigued and started improving the design. 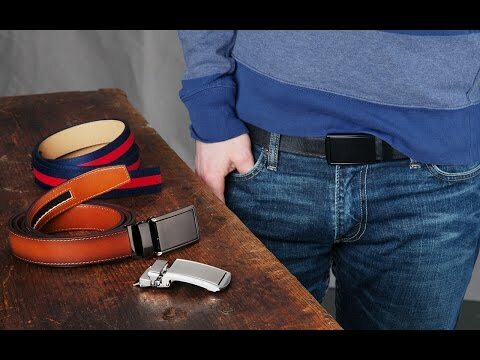 Six generations of SlideBelts later, they have achieved a simple, functional belt that is beautifully constructed. The buckle is remarkably low profile. Adjusting the belt is smooth, thanks to the dual-lever ratchet. There’s even a built-in bottle opener, because—why not? The belts come in top grain leather or beautiful canvas, with your choice of interchangeable metal buckles. Each buckle stays securely attached to the belt thanks to a deep tension grip. Simply cut the belt to size and place the buckle over the raw edge. And don’t worry if you cut off too much. 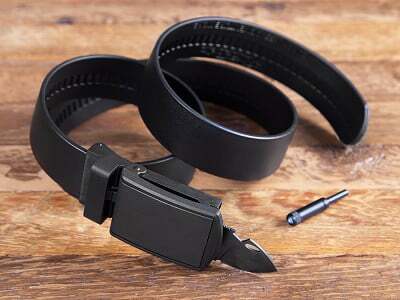 SlideBelts graciously offers a free replacement. I think this looks like a GREAT product! Any chance you will be expanding into Big & Tall sizes? @T D Thank you so much! Our belts currently fit a pants waist size of 48 inches -- so the full length from tip to tail is 55 inches. We currently don't have plans to make our leather belts longer than 48inches. However, later this year we are coming out with a vegan, non-leather version that will be available in any length. I need really flat belts and this look like just the right thing. Is it REALLY flat when on jeans, etc.? Pictures all look like men...OK for women too? @Vivian Yes they are ok for women too! I'm wearing one of our square buckles in the video; you can kinda see at about 1:25. I have many women guests who wear our belts, and in fact we are doing a photoshoot this month with a female model so my ladies can see how to rock a slidebelt. 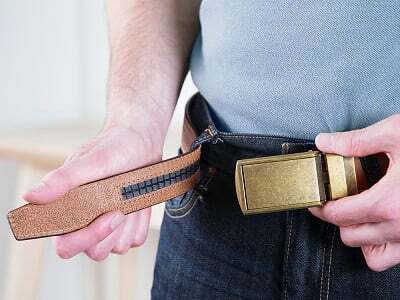 I know what you mean about wanting the belt to be flat (that bulge from covering your belt with your shirt! ), and while our belts are flatter than your average belt with holes, you can still see the belt in profile. In order to make them thinner, we would have to make the buckles in a different material. That's one of the projects we are working on this year - experimenting with different materials. Excellent questions Vivian! Thanks! Hi Michelle, I was wondering if you thought aboubt making a child belt for the toddler on up. It would be a good accessory for those pants with no elastic for their growing bodies. Just to explain her reference, we used to be called "Erik Blaire SlideBelts" before we changed it to just SlideBelts. And yes, she put stickers on her buckle LOL! How is this different from a previous Grommet - Mission Belt? Hi Robbie, the biggest differences are the materials and the belt buckle. 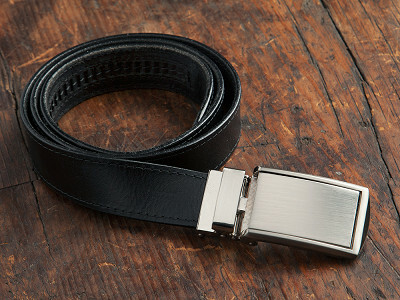 SlideBelts use full grain leather as opposed to genuine leather with a synthetic coating. We also have a canvas option on the SlideBelts. Also, the belt buckle on SlideBelt is a bit more sophisticated which allows for an easy release of the buckle. @Robbie, The concept is similar, but our buckles operate differently. We used to sell that same buckle up until 2012 (see video at 50 seconds for that first buckle) -- before we upgraded it to what you see now. We innovated away from that buckle for many reasons, but in short because it was more difficult for customers to use, and would jam more often. Also the release lever can be more difficult to reach because of it's location on the underside of the buckle. @Mike, thank you for the clarification on the differences in strap materials! @Michelle Mission belts were probably mentioned because Grommet sells them too ... they were featured in November 2013. You have other competitors like http://koreessentials.com/ ... since you didn't patent the mechanism you don't have much grounds for your grip at Reddit, though I understand the family issue grates.Improve your business acumen and move on. @Jim Part of the reason for this community--and the behind-the-scenes assists Grommet Makers give to each other--is to transfer lessons learned. I know my own business acumen improves every day because of the shared lessons and wisdom of our Grommet Makers, like SlideBelt. @neil, sure just follow us for the most current updates! Hey Michelle! Looks like a great product; how tight can you cinch it? I like my belts pretty tight so I'm curious as to your input here. @Wayne, You can trim the leather down as small as you would like, therefore you can tighten the buckle as tight as you would like! Put it this way, we tested the buckles and they can withstand almost 200 lbs of direct tension. Thanks Wayne! How 'sticky' are these belts? I bought a 'normal' belt once that was so slick on the backside that it was difficult to fasten. Kept on moving around my waist. @James, Don't worry, they grip enough that they will not be moving around your waist. How is this product different than Anson Belts? 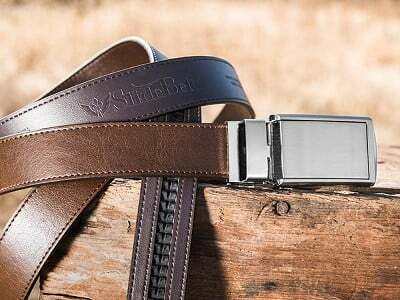 @Vicky, Anson Belt uses the same buckle mechanism as Mission Belt, which is the same buckle mechanism we sold up until 2012 before innovating to our current unique buckle. See my response to Robbie above for more details. Thanks Vicky!! I would love a vegan option at some point - we don't wear leather and there's not much out there that looks as nice as yours! @Andreea, Yes I have had requests for vegan, non-leather belts for awhile, which is why we are coming out with one later this year! This is a nice bet but not functional. It may be good for decorative piece . In one word it is a piece of junk and waste of money. @Roh, How do you know it is not functional? Have you tried it then? Please try before unfairly judging. Roh, I don't know about you, but I wouldn't use a piece of junk as a decorative piece. We understand the price may be higher than some are comfortable paying and that's valid. But know that the materials used are meant to be long-lasting even more so thanks to the innovative design which eliminates the need to poke holes in the belt. We also found them to be extremely comfortable and fashionable. SlideBelts certainly provide a bang for your buck-le. @Mike, That was a much more helpful response than mine! Well done Mike, well done. @Michelle glad for your new response, the grommet is always a mellow site, comments have been so important for me purchasing here, let's keep it civil? thanks. @christopher I am really appreciating your comment here. Thanks for adding your voice. As Grommet CEO I read every single thought posted on the site and we have nurtured this civil (mellow) tone very deliberately. I am appreciating Michelle's update too...though the regular supporters of our Makers here surely understand why you might react quickly to a criticism of your "baby." @Jules agreed, tho the reason here for the "makers" here is to "market" they're "babies", if I'm reading you correctly. when I come to the grommet,(everyday), I rely on concise information for an informative purchase. any public forum will consist of differences of opinion. in retrospect, for my first of two responses, I'm going to humble myself here, apologize, and rethink first response to this item. thank you Jules. @christopher, @Jules, and @Roh. I'm sorry I think my comment was read with sassy sarcasm, when I didn't intend it to be that way at all! I realize it's hard to convey my tone over a discussion board. I'm sorry guys! If anyone has tried our belts, and doesn't like them, then that is entirely fair to say so and please speak up! If you simply don't like the way they look, then that's fine too. Please help others reading this board to elaborate on why you feel that way. Honest constructive criticism also helps us too; we've evolved and improved our belts over 5 generations based on your feedback. For example, one of our earlier buckle versions had sharp corners that actually ripped someone's shirt! I obviously didn't foresee that, and was grateful to the customer who brought it to my attention. You better believe that I fixed that real fast, and our next buckle version had rounded corners! Can you describe the difference between the matte black and gunmetal buckles? I can't tell from the photos. @Julia, yes the Matte Black Buckle is on the model with the blue sweatshirt before you play the video. The Gunmetal Buckle is a brushed dark metal that is shinier -- see it in the same image on the table attached to the light Cognac Leather. Also when checking out, when you select your buckle and strap color, the image will change based on on your selection. Hope this helps! You seem to need a loop to capture the excess belt ? @james And is the leather strong enough to carry a concealed carry pistol @ 28 oz. ? @james, Yes there is no loop- by the nature of the cut-to-fit, the loop would not be attached to the strap, and is not really needed because you control just how much "excess" the belt has. :) I recommend having enough slack to feed it through the first pants loop, but not so long that it reaches the pants loop by your hip. @James, yes it could handle a weapon, but we are coming out with a durable, more "tactial" survival belt later this year that will be built more for carrying. That's what I would recommend. is there stitching where you cut to fit? what happens to the stitching? ncould it fray, or come apart? thanks so much! @christopher, The strap is designed to be cut so the stitching will remain intact. The cut end of the strap is inserted into the buckle and is not visible anyway, so no worries! My husband plays a guitar. He has had a belt buckle that had a leather 'patch' on it that was an advertising logo. It is just about perfect BUT it is also just about worn out. The company that we purchased it from no longer sells belt buckles. Is there any way for a piece of smooth leather to be attached/glued on to the smooth part of the buckle? @Polly, Is the belt your husband has a ratchet style belt (no holes)? Our buckle has a dual lever release that functions very similar to an airline seatbelt, so if I'm understanding you correctly, placing a patch of leather on the buckle face would impact its functionality and I would not recommend it. You need to be able to lift the outside frame of the buckle face to disengage it from the notches on the leather. Thanks for your question Polly! @Michelle I was planning on a piece of leather that was recessed within the buckle. What is the width of the belt? Hi Steve, the width is 1.25"
Are the belt buckles made of Non Allergenic or coated material? I have a nickle allergy and most belt buckles give me a rash..
Hi Paul, the buckle is made of zinc alloy. Hope this helps! @Paul, yes our buckles do contain nickel for strength. Nickel is the most common metal allergy so you are not alone. That's why we made a hypoallergenic version available in Gunmetal ONLY. When checking out on Grommet, on step #2 (picking your shipping method) check the box that says "I want to add a gift message to this order." In that box, please leave us a note that you would like the Hypoallergenic Gunmetal version, and we'll make sure the right buckle is packed for you! Just be sure to purchase the strap you want with the gunmetal buckle and leave the note so we know. Thanks Paul! @Chuck, yes it will most likely be on the Grommet so stay tuned! Hi Bonnie, as Michelle mentioned above, the SlideBelts are great for men and women. They are working right now on developing a flatter version of the belt which may be more in line with what you looking for. Stay tuned! With holes spaced out every inch or so, it’s not surprising that traditional belts rarely fit well. SlideBelts take a no-hole, precise-fitting approach. 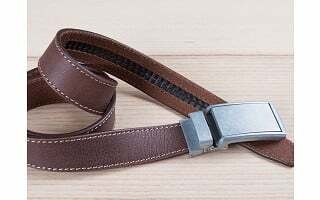 You can adjust the belt in 0.25” increments, via a tiny tab that catches on 30 teeth-like ridges sewn subtly on the belt strap. Husband-wife team Brig and Michelle Taylor have been perfecting SlideBelts for almost a decade. Back in 2004, Brig was teaching in Moldova when a student gifted him a ratchet belt. The Taylors were intrigued and started improving the design. 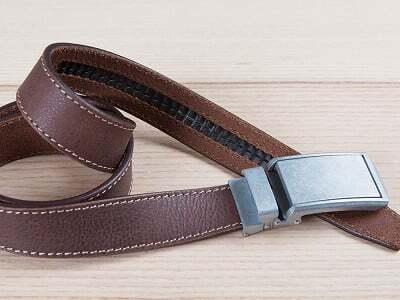 Six generations of SlideBelts later, they have achieved a simple, functional belt that is beautifully constructed. The buckle is remarkably low profile. Adjusting the belt is smooth, thanks to the dual-lever ratchet. There’s even a built-in bottle opener, because—why not?